Have you heard of Brag Tags? They are plastic tags that can be hung on lanyards, chain necklaces, or hung on backpacks. The tags have colorful messages on them and can be used as rewards for your students. I am always on the lookout for new ways to motivate students. Sometimes when you teach older students, they develop this attitude of “been there, done that” when it comes to incentive plans. They’ve already experienced the treasure box, sticker charts, and all the other goodies that are in a teacher’s bag of tricks. The best thing about Brag Tags is, they are a new concept and that should motivate your most disengaged student. Click HERE and check out the designs. I have a special surprise for my followers. The owner of Brag Tags is going to give one of my lucky followers 100 Brag Tags. In order to enter, you need to leave your name and email address in the comment section of this blog post. I will email the winner on November 7th. You will have 48 hours to respond to my email. If no response, I will choose another winner. I would love to win these…fingers crossed! 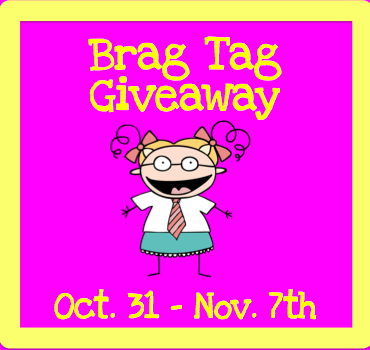 I would love to win some brag tags. Thanks. Thanks for the chance to win the brag tags. Wow! I'm the first to leave a comment!! I'd love the brag tags for my 2nd graders. Those are very cool! Kind of like motivational stickers, but permanent! My email address is msangelread@gmail.com. What a wonderful idea! I have never heard of them! I love brag tags! They are a great addition to my AR neclaces. I would love to win. What a great idea! I hope I win! How nice of this company!! Thanks! Brag Tags are a great incentive. **See, I do read these!!!! Oh I hope I win them!! These would be perfect motivators for our students! I would love to be the lucky winner for my students! I'd love to use these to motivate my fourth graders! I work in the Media Center and would love to offer these as an incentive! I have these on my wishlist. Fingers crossed. 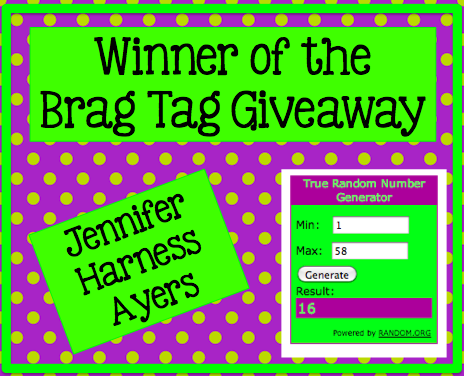 I would love to win brag tags! How cute!! These are great! Hope I win. These are great. Hope I win. These could be great to help motivate my kids, and go along with our AR dog tags. Hoping to win! Love Brag Tags! Would love to have Brag Tags!! I have really been wanting some of these brag tags for my kiddos! Thanks! Great positive idea for students…thanks! I would love this! They look great! Thanks for giving them away. These would be awesome for my students, they love to hang things on their bags this year! Fun giveaway!! Love Brag Tags! Moving to a new grade level has been exciting but a learning experience! This would be GREAT for my kids!!! These brag tags are too cute. I'd love to win them! Our PTO used to give these to "American Readers' (reading 25 books) but stopped. They're soooo cute!! Would love to use as incentives! Thank you. I love the idea of Brag Tags!